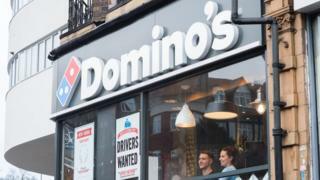 Dozens of firms, including Domino's Pizza, JD Sports and Greene King have been told to put more women in their boardrooms. The review has threatened to brand them "red tops" as a warning to investors about their lack of gender diversity. They said it was "unacceptable" that one in five of the UK's biggest companies in the FTSE 350 index are falling short on gender diversity. Of the firms singled out, 66 have only one woman on their board, while three firms - property investor Daejan Holdings, Millennium & Copthorne Hotels and TR Property Investment Trust - have an all-male board. The Investment Association has 250 members which manage £7.7tn in assets. Its boss Chris Cummings said that it is "unacceptable" that one in five of the UK's biggest companies are falling short on gender diversity. "Companies must do more than take the tokenistic step of appointing just one woman to their board and consider that job done. "There is also compelling evidence that boards with greater gender balance outperform their less diverse peers," he said. The Hampton-Alexander review was commissioned by the government in 2016 to deal with corporate gender inequality and set targets for Britain's biggest companies. Sir Philip Hampton, who chairs the review, said the fact that companies had failed to bring women into board rooms and into leadership positions "does not reflect the population of very talented women capable of making great contributions in boardrooms". She said: "The role of investors is important here too and they need to assert themselves to ensure that diversity is reflected more visibly at board level." Other companies on the list that only have one woman on their board include St James's Place, 888 Holdings, Just Group, Acacia Mining, Stobart, Restaurant Group and Softcat, among others.